Ever since I was a kid, I’ve been a wee bit obsessed with paper moons, finding it difficult to resist that sinister smile on Mr. Moon’s skinny little face. Paper Moon is one of my favorite films (I love the book too, Addie Pray, on which it’s based), and over the years, I’ve added a few to my vintage photo collection. (Okay, more than a few, so I’ll share more of these in a future post.) 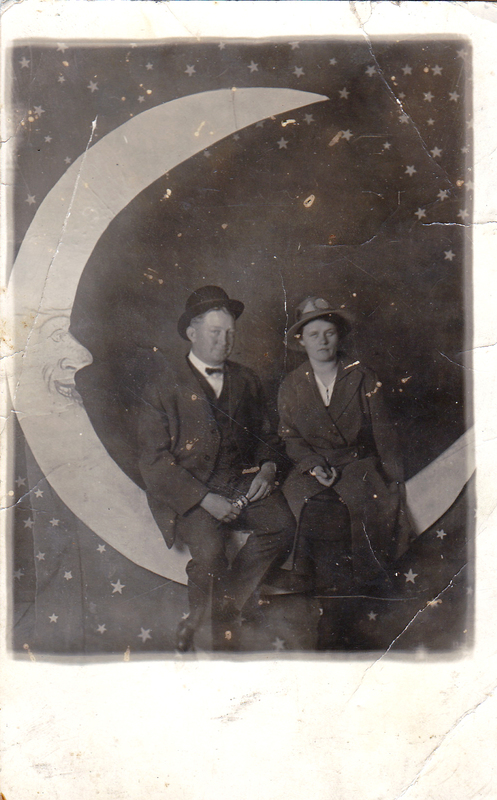 Paper moon photography, according to this article from the Hutchinson News, was popular from the late 1800s to 1930s – think of them as a photo booth precursor, a way for people to capture a silly moment when going to a carnival or state fair. 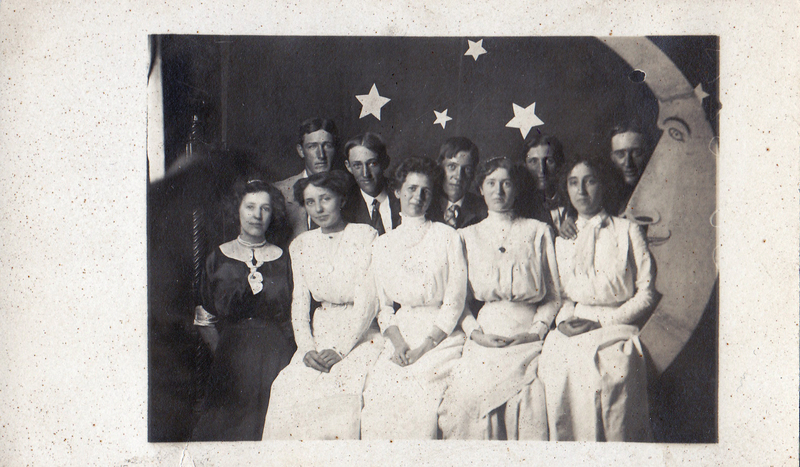 It wasn’t practice yet for people to smile at the camera, so finding one of those too is always a treat. 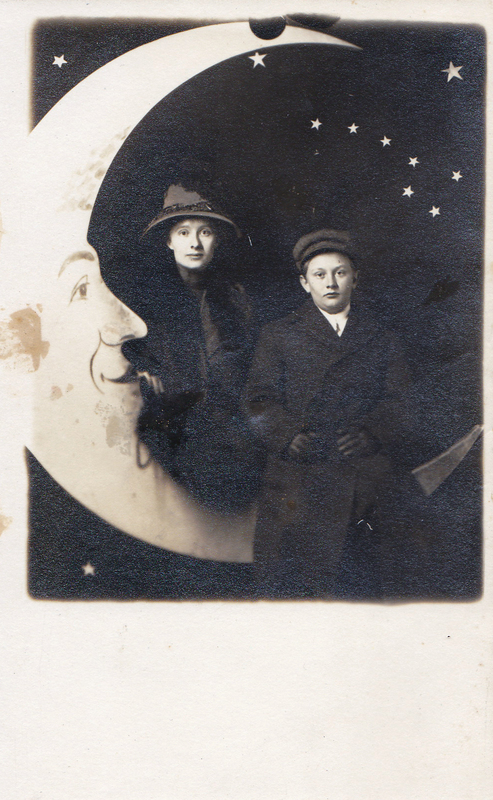 My first paper moon image: stereoscope found in a Gettysburg flea market. Edwardian mother and son. I love the moon’s face on this one. 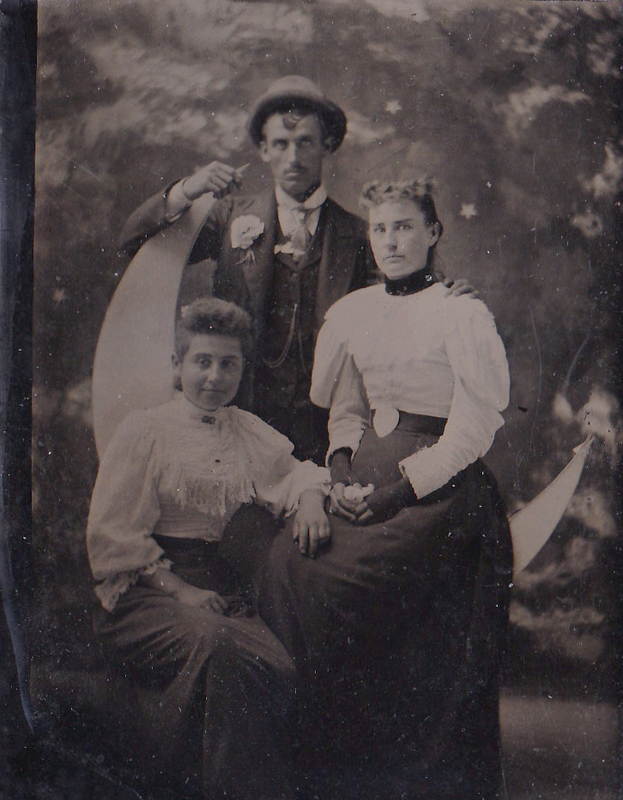 Tintype, 1890s. Note the tiny details on this one: the woman’s black mitts, the painted sky background, how the man holds on to the top of the moon. I dunno Lisa, I have always found the man in the moon images somewhat scary. 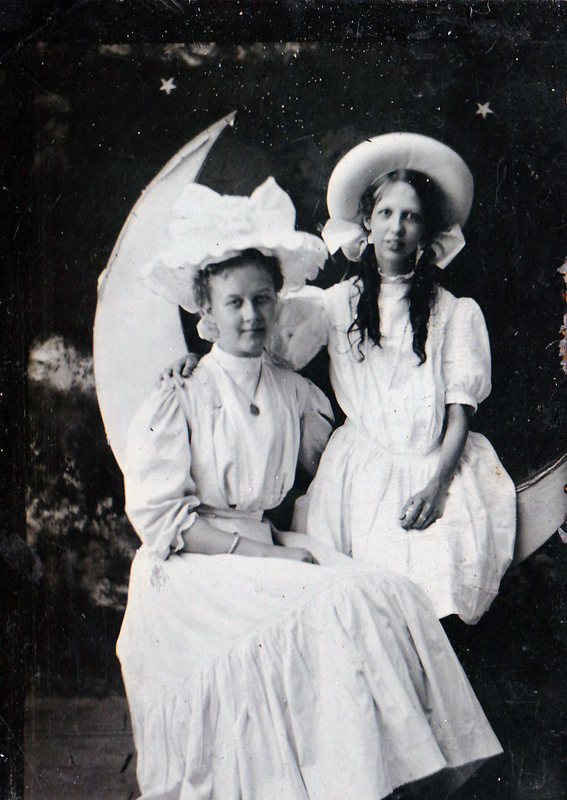 These photos certainly capture that weird dynamic (no one is smiling, just the moon image). The “Man in the Moon” illusion, familiar to various cultures around the world, was created by powerful asteroid impacts that rocked the satellite billions of years ago, a new study suggests. The study, performed by Laramie Potts and Ralph von Frese of Ohio State University, reveals that ancient lunar impacts played a much larger role in shaping the Moon’s surface than scientists had previously thought. It may also help explain the origins of two mysterious bulges on the Moon’s surface. The new analysis reveal that shock waves from some of the Moon’s early asteroid impacts traveled through the lunar interior, triggering volcanic eruptions on the Moon’s opposite side. Molten magma spewed out from the deep interior and flooded the lunar landscape. During a full Moon, some of these patches combine to form what looks like a grinning human face, commonly known as the “Man in the Moon.” The man’s eyes are the Mare Imbrium and Mare Serenitatis, its nose is the Sinus Aestuum and its grinning mouth is the Mare Nubium and Mare Cognitum. I agree completely – they always scared me too, as a kid, but I couldn’t help but be fascinated by them too. 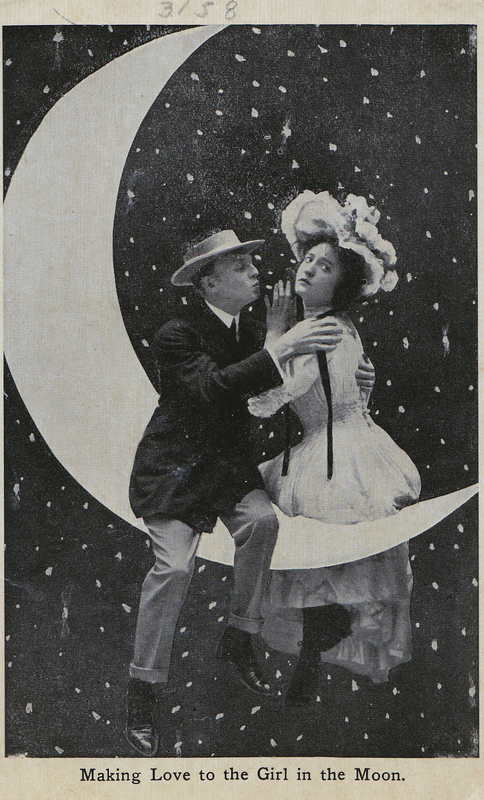 Thanks for the this information on the origins of the “man in the moon” – I have more moon photos that are less sinister, more mystical – and may be good examples of people’s fascination with the “man in the moon” a century earlier. I also love the one with the inscription on the reverse side. Hello, Dolly! I love paper moons, but they are really hard to find, at least in my part of the country. I love your collection. Thank you for sharing your paper moons on Instagram – they are incredible, really! I’d love to see them on your blog, if you can think of a post to work them in. I found most of these through ebay or etsy. Even online, they don’t show up often, and when they do, I try to budget them in – sometimes sellers want a pretty penny for them, and as much as I love them, I have to resist sometimes! It’s the whole reason I had to own this one! These are all beautiful. I love the stereoscope, the Baby Moon, but then I also love the ones with the face in the moon. I like the title “baby moon.” If you ever see any of these while estate-sale hunting, you know to pick them up! Paper moons are magical. Makes me think of old Hollywood. Gorgeous. They are! Next step: getting Jeff to make me one for my birthday. Oh man. I can not wait to see the photos. I want a paper moon image.